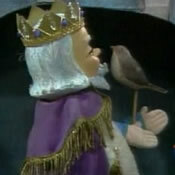 Troglodytes Aedon is one of King Friday's pet wooden birds. Perched on a stick, Troglodytes Aedon shares the role of royal pet with Mimus Polyglottos. Troglodytes Aedon and Mimus Polyglottos once went missing when they were taken for a walk by Robert Troll. "Troglodytes Aedon" is the scientific name for the common house wren.